Positano is three hours south of Rome and rightly classed as one of the best beach holidays in the world. It's right in the middle of the famous Amalfi coastline and is such a stand-out that words can't really fully describe this romantic Italian holiday spot. You can get to Positano by train from Rome to	Naples and then Sorrento, before the hair-raising bus ride around hairpin bends with a driver who sometimes seems to stop you falling down the cliffs. Many travellers now fly into Naples these days with discount airlines including Easyjet. Positano itself is built into a cliff with a winding one-way avenue down from the top to the beach at the bottom before winding back up with all the accommodation near by built into the same cliff. The ocean vistas from hotel accommodation either side of the cliff are absolutely stunning. You can also see the many ferries that pull into the shallow harbour to take you to the island of Capri, south to the town of Amalfi, or north back to Sorrento and on to Naples. Make sure you try some of the delicious southern Italian lemon liqueur known as Limoncello, which is proudly made from the plentiful lemons that abound around Positano and Sorrento. In Positano, it’s all about location. Hotel accommodation near the beach in Positano is varied and almost always booked out in summer. If you want comfort and style, go straight to the Hotel Poseidon, with its perfect location half way up the hill overlooking the breathtaking ocean views below. You can easily walk down to the beach from here, past all the little streetside cafes that give this exuberant holiday town its atmosphere. The Hotel Poseidon has an elevated area with a pool and restaurants that provide true southern Italian atmosphere, perfect for a relaxing cocktail as you watch the world go by below. Here at the Hotel Poseidon, the terraces have a Moroccan feel and glorious comfortable lounges, overlooking one of the world's great views. If you want to stay somewhere small and family-orientated, there’s a cute Bed and Breakfast called Dimora del Podesta half way up the hill; a nice little B and B with great views over the bay. It’s run by the enthusiastic Pietro, recently married and very good at carrying on the family tradition. The rooms are spacious with beautiful Positano ceramic tile floors and the excellent family restaurant below, called Ristorante Saraceno d’Oro (see below). Pietro cheerily serves a very good breakfast included in the reasonable price on your terrace each morning, allowing you to enjoy the ever-changing street theatre below with those beautiful ocean views in the background. There’s a wonderful family room with a fireplace here at Dimora del Podesta called La Musica, which sleeps four and has a wonderful history. Pietro’s grandfather used to live in this room and played clarinet while enjoying the ocean views from the balcony. The sense of family here in Positano is so strong that there are still photos of Pietro’s grandfather prominently displayed. Saraceno d'Oro is half way up the hill and combines delicious southern Italian cooking with great value. You can eat al fresco on the narrow winding road with a sea view as musicians serenade you, or inside in the atmosphere of a genuine southern Italian family atmosphere. Restaurants further down near the water are more expensive but still reasonable, including da Vincenzo and Il Capitano, where you'll enjoy the most stunning al fresco view over the ocean. But the highlight over your Positano experience has to be the quick ride on the small boat with the red fish around the cove to Da Adolfo, the rocky beachfront restaurant with superb food and only one blackboard menu with everything written in chalk in Italian. You can only get there by the 5 minute boat trip and the service can be barefoot, the waiters can seem aloof, but the seafood is sensational. It's all watched over by the gruff Adolfo who has a heart of gold and pride in what he offers. On the hill above Positano, you'll find La Traviata and Il Ritrovo, which have superb menus and views over Positano below. 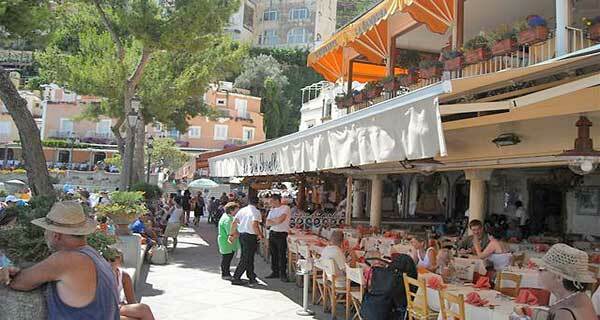 The Positano Cafe is another good place to eat, with elevated ocean views that many Positano cafes enjoy. 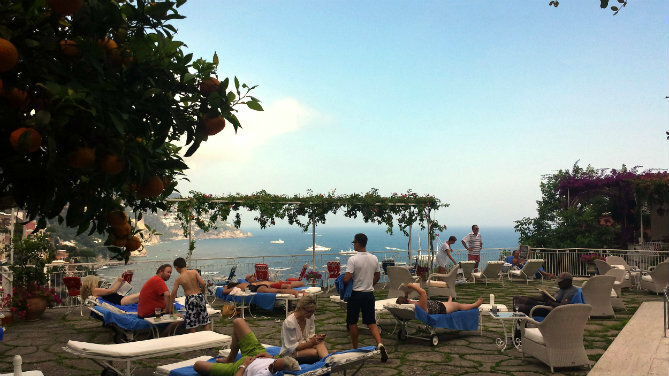 A favourite hotel in Positano is Buca di Bacco, which is right on the beach. You're assured of an effusive southern Italian welcome from manager Francesco or the smooth Giovanni in the restaurant overlooking the glorious views ( see photo). On the beach here in Positano, for great Italian fashion, go to the Antica Rustica shop right on the corner of the little harbour. And for those colourful ceramic plates that often have the trademark Positano lemons featured on them, try the shop half way up the walk from the beach with the bustling lady boss. 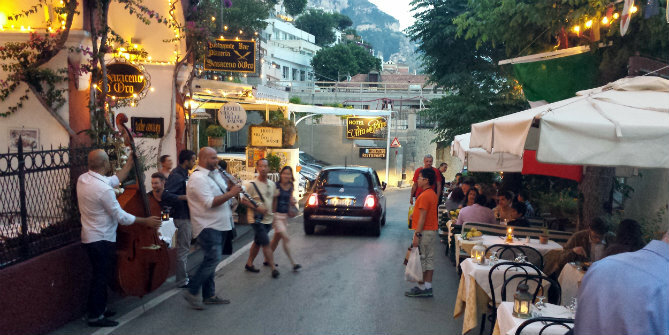 The quickest and best way to Positano from Naples is a limousine that will cost about 100 Euros. You'll arrive happy and swiftly, saving precious holiday hours over other options. 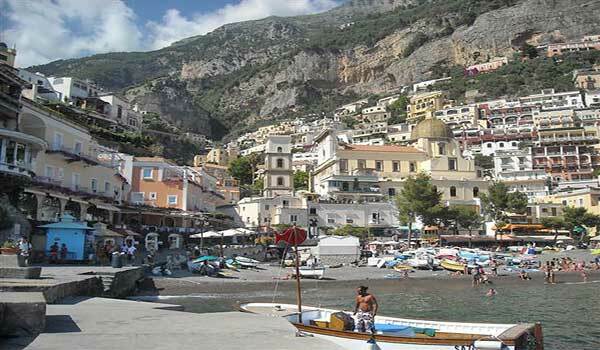 La Mammola Car Service is the best in Positano for price and service (www.xploreamalficoast.it, ph +39 338 5451697). Owners Giovanna and Salvatore will reply to your email promptly and pick you up in a comfortable Mercedes with mature drivers who will give you historical tips on the way. La Mammola is renowned for being on time, something you have to be very careful of in Positano with vital deadlines to get to Naples Airport. Salvatore has been doing it for more than 10 years with a passion for service, inherited from his father Giuseppe. Or a quick and fun way to get to Positano is by train from Rome to Salerno south of Positano, then just a 5 minute walk to the port for the connecting 30 minute ferry stopping at pretty Amalfi on the way. Or there's the hair raising bus ride around the Amalfi coast cliffs, with frequent services and lots of traffic on the narrow cliff road. If you want to come to Positano by ferry from the north, there are services from Sorrento that also take in the pretty nearby island of Capri with its blue grotto and wonderful atmosphere. There's also the hit and miss ferry from Naples that you want to make sure is running, before you find yourself stranded. We'll save the best for last - Positano's main beach may be pebbly, but the water is wonderful and still clean despite the water traffic. There's not much better than taking a dip on a Sunday morning, with the bells ringing from the domed church nearby, and the happy Italian families thoroughly enjoying themself on one of Europe's best beaches. Positano is a must-see destination for a best beach holiday you'll always remember. Best Positano beach holiday travel destinations are written by dedicated photo journalists, published and edited by the Best Beach Holidays Travel writer. Contact Best Beach Holidays to submit your beach holiday articles.